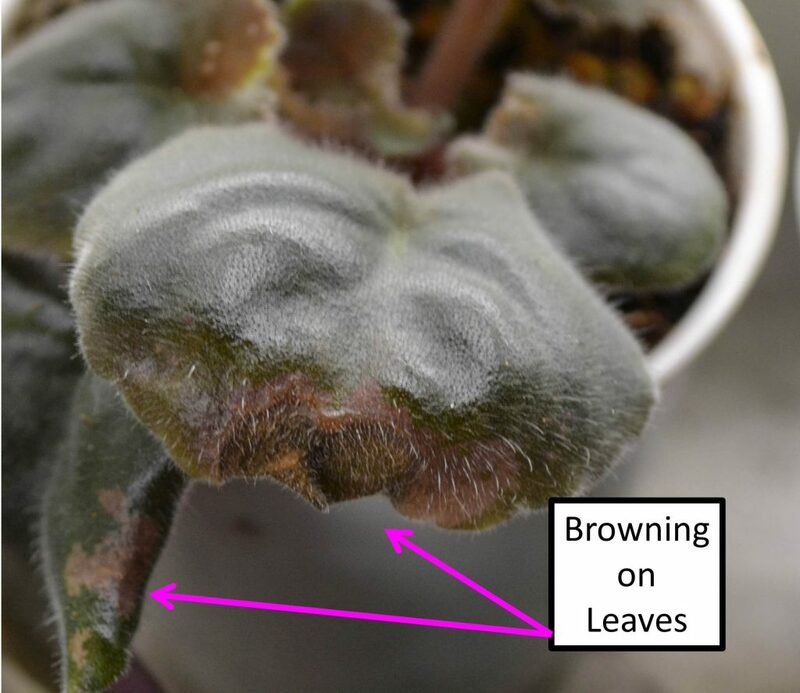 Why do leaves turn brown on my African Violet plants and how to prevent it? 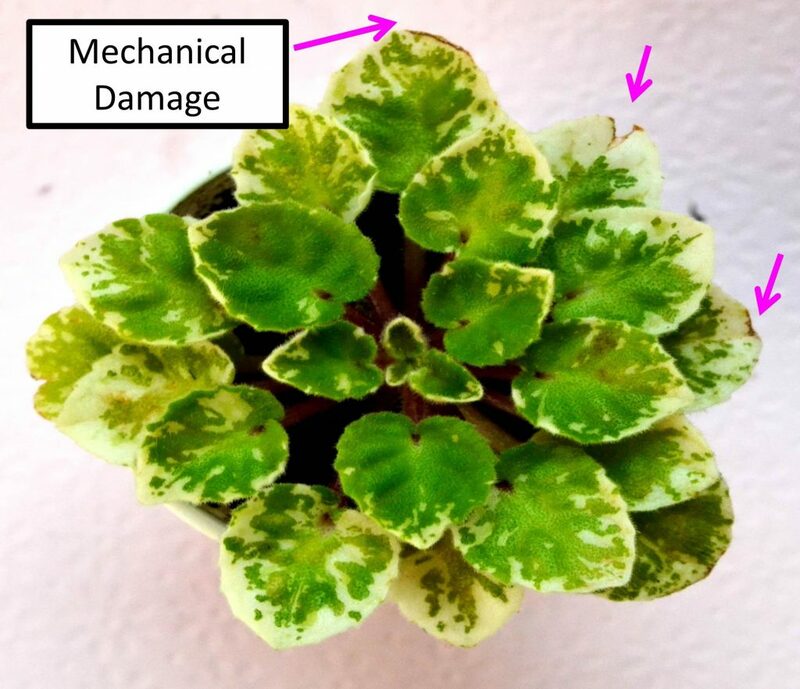 Normal growth: As the plant grows, some of the older leaves on the outer ring will turn brown and it’s time to remove them as part of routine plant grooming. 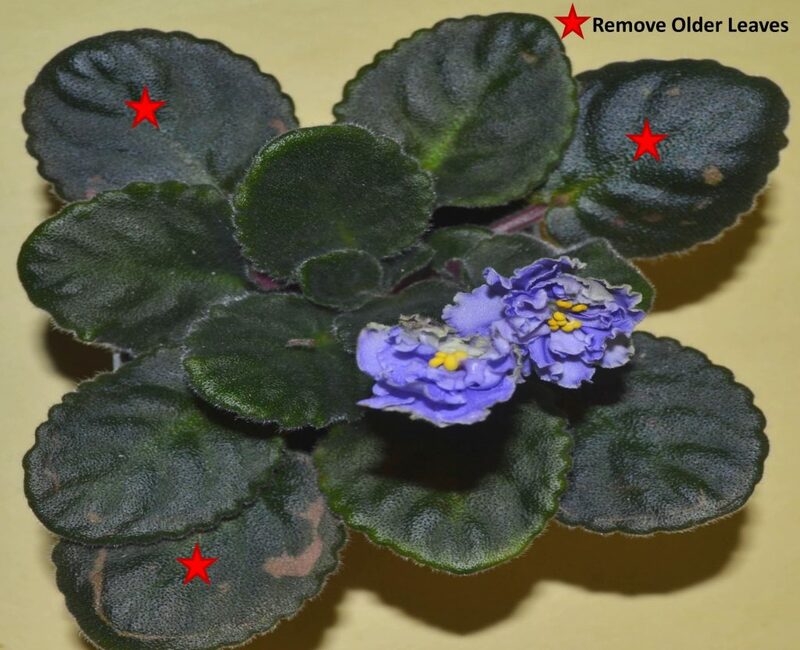 This is the normal aging process of the African Violet plant. 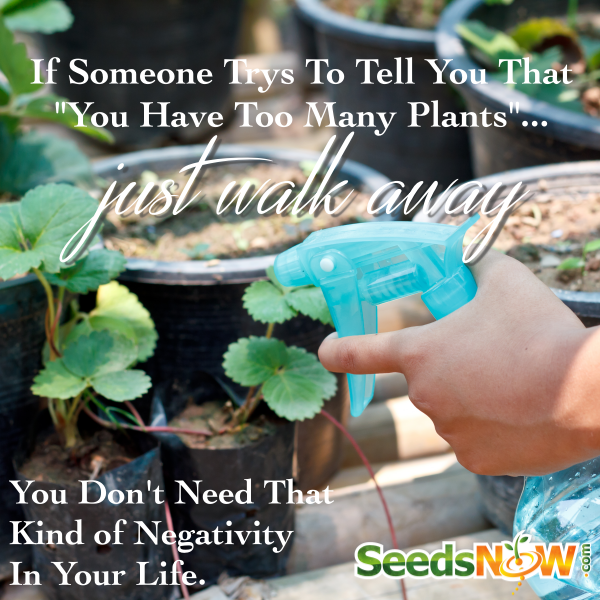 Over-watering: if the soil mix is soggy and wet, it means it is saturated with water. 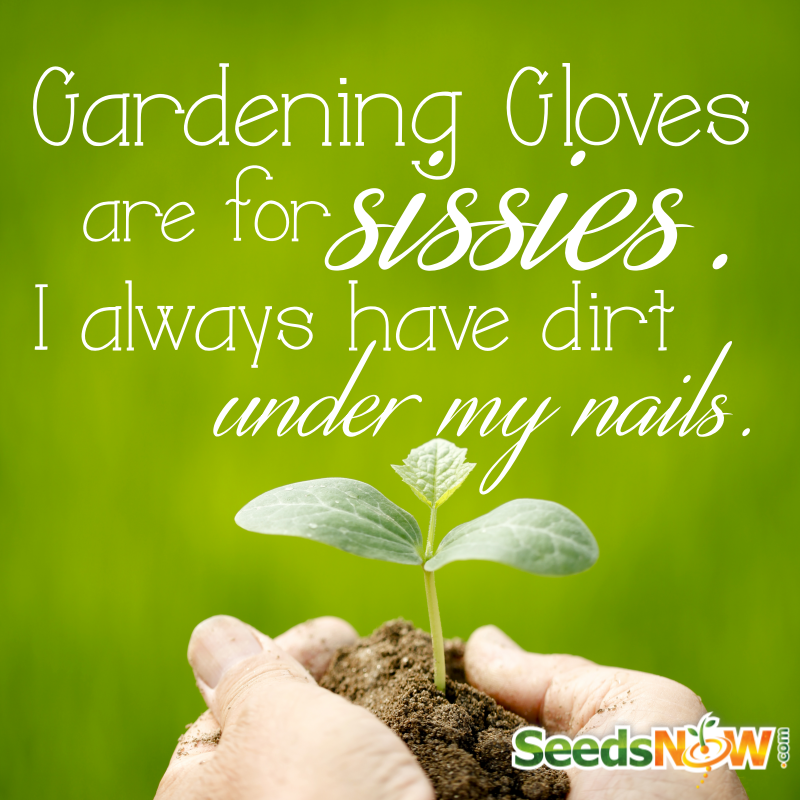 This will cause the leaves to take up this excess water and become brown and limp. 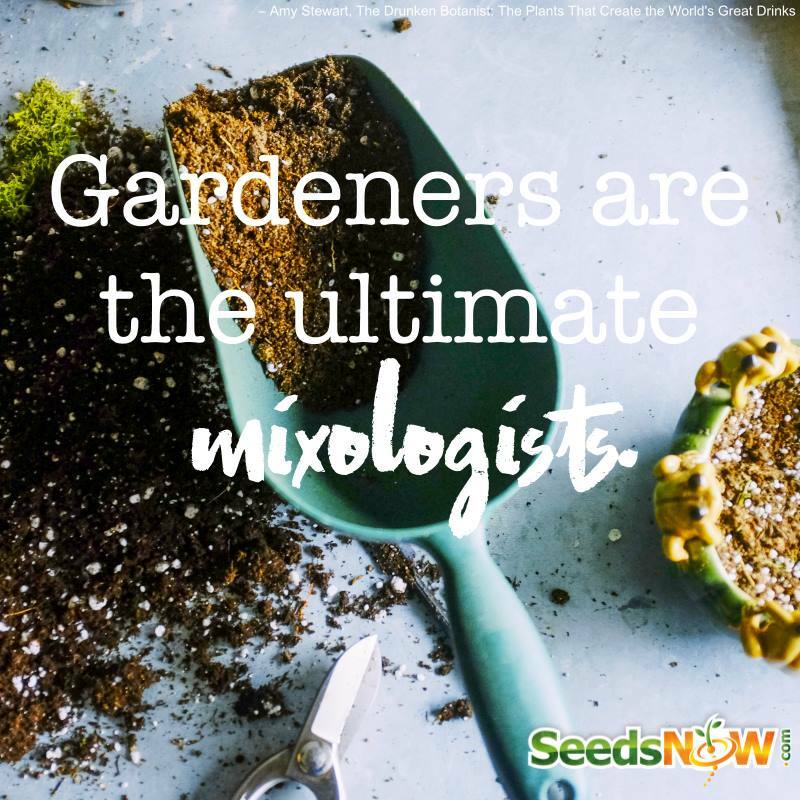 In this situation, its best to let the soil mix dry out in between watering’s. The plant shouldn’t be bone dry (pot is really light weight when lifted), just such that the top of the soil is dry to touch. 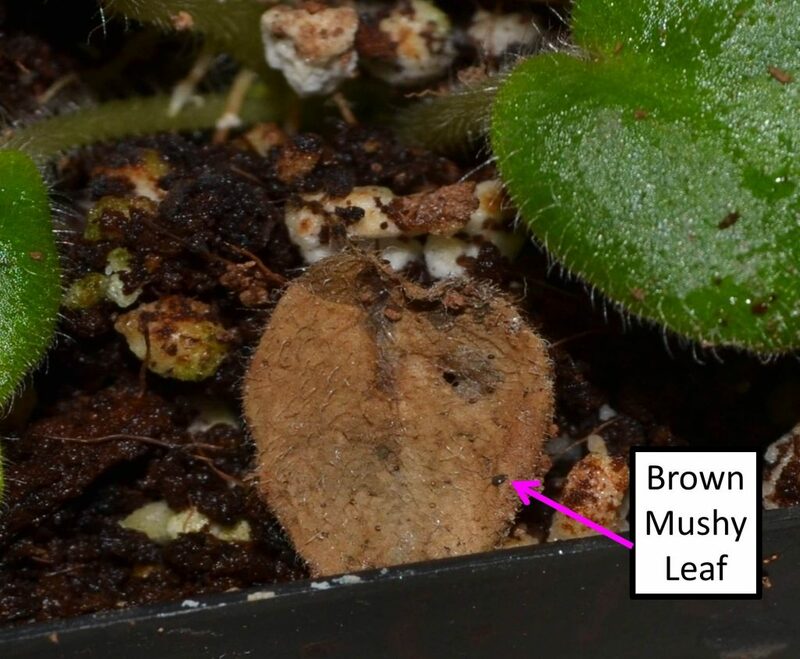 Soil Mix: If the soil mix is too heavy, it can lead to water being collected in the soil resulting in brown mushy leaves. Always use a light airy soil mix containing perlite or vermiculite and peat moss for African Violet plants. This will help with better water drainage. 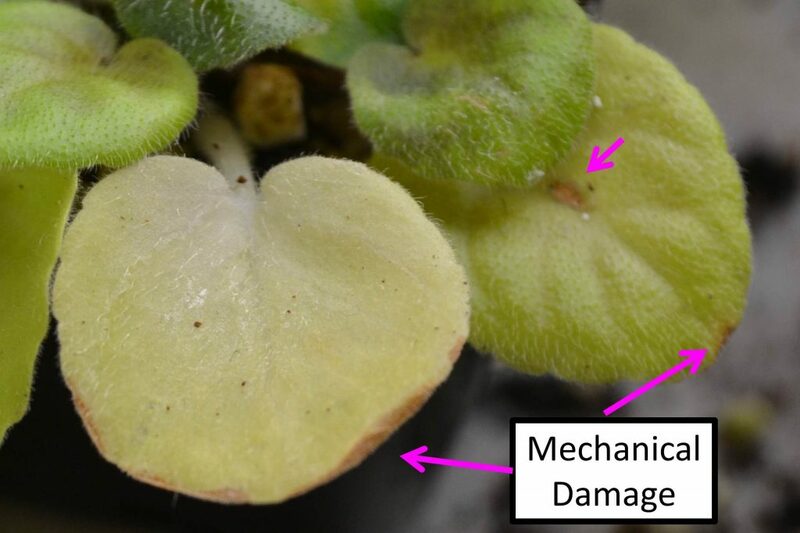 More helpful tips can be found in the “African Violet Soil /Potting Mix” article. 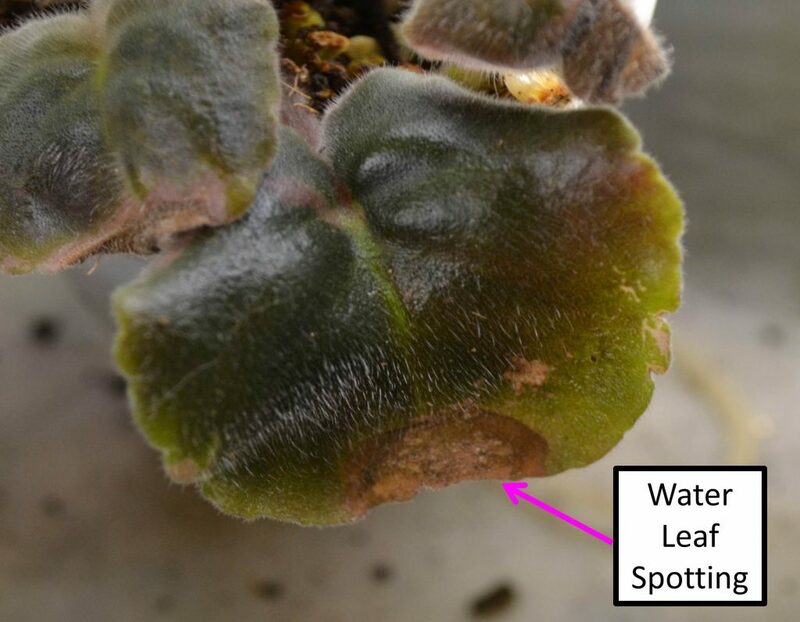 Water leaf-spotting: While watering African Violet plants, if water spills on the leaves, it can result in brown spots. If water does fall on the leaves, remember to wipe the water off and don’t let it collect on the leaves. Once in a while it’s good to clean the leaves with water, just gently wiping the leave with a moist tissue/cloth. 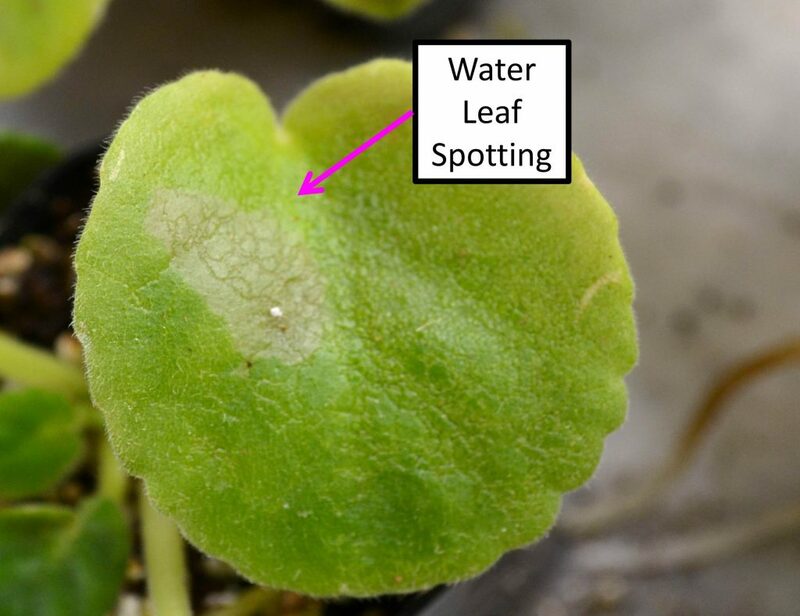 However, if water starts to collect on the leaves, it can form brown spots over time. Remember, not to splash cold water on the leaves of the Violet, always water the soil mix from underneath the leaves. 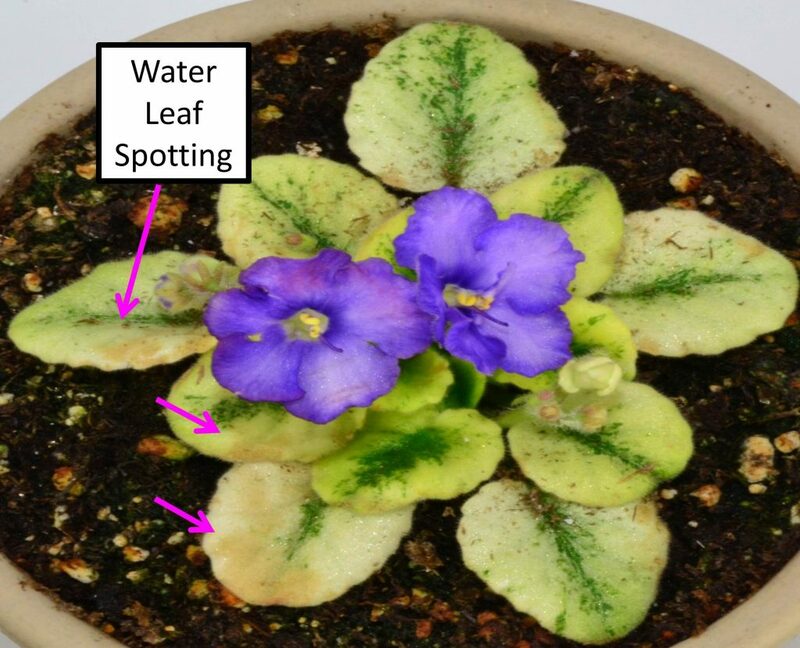 More general watering tips can be found in the “Ideal Conditions to Grow African Violets” article. 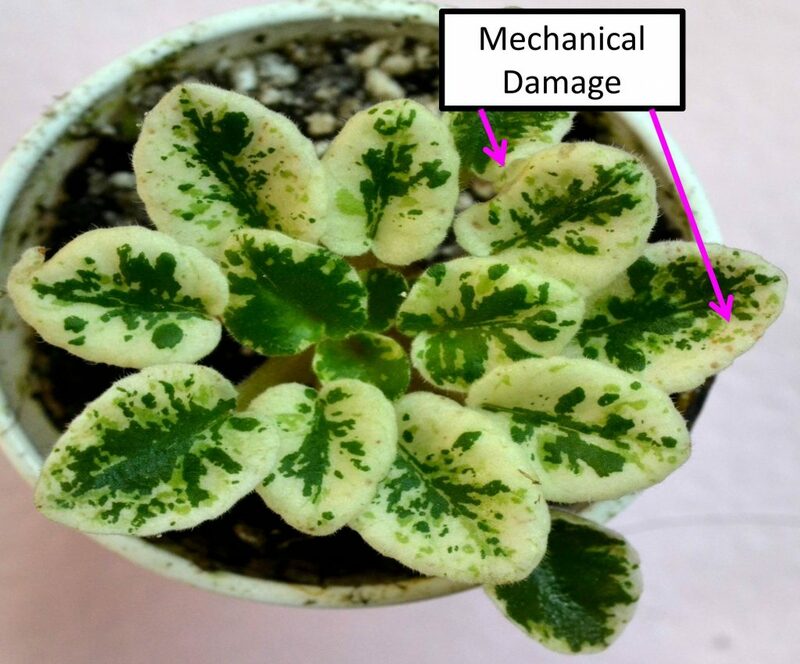 Chloramine in water: In certain municipalities it is common to add Chloramine to the tap water; this chemical can be detrimental to the African Violet leaves. 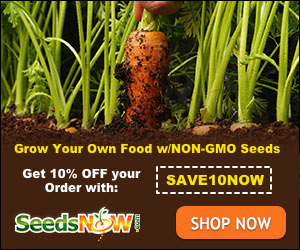 It can start with browning leaves, burning of leaves, and eventual dying off of the plant. Check with your water supplier if Chloramine is present. 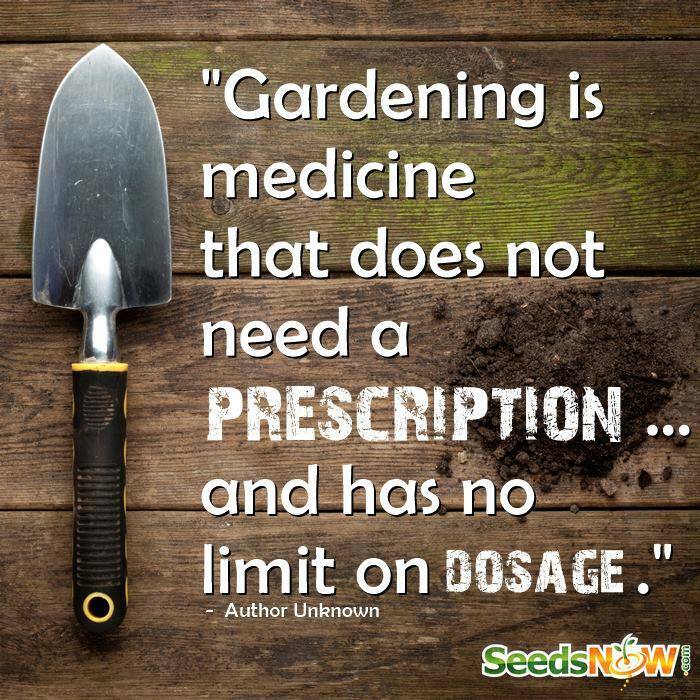 If it is, you can use spring water, distilled water or rain water for watering’s. 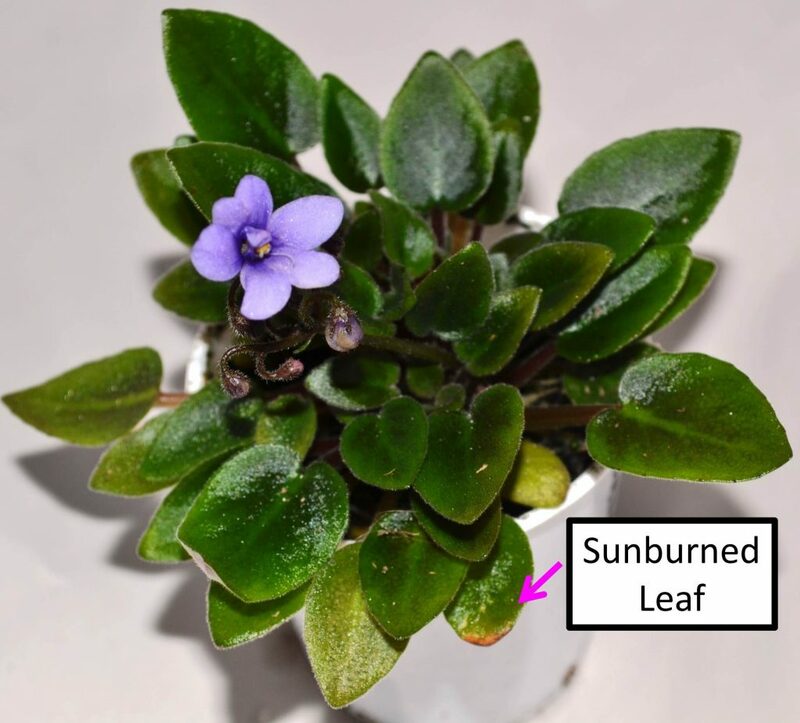 Excessive light: If the plant is sitting in a hot sunny spot, the leaves will start to brown and get sunburned. 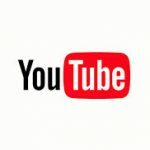 Move the plant to a shaded area receiving indirect filtered light or pull down the shades, sheer curtains, to allow less light falling on the leaves. 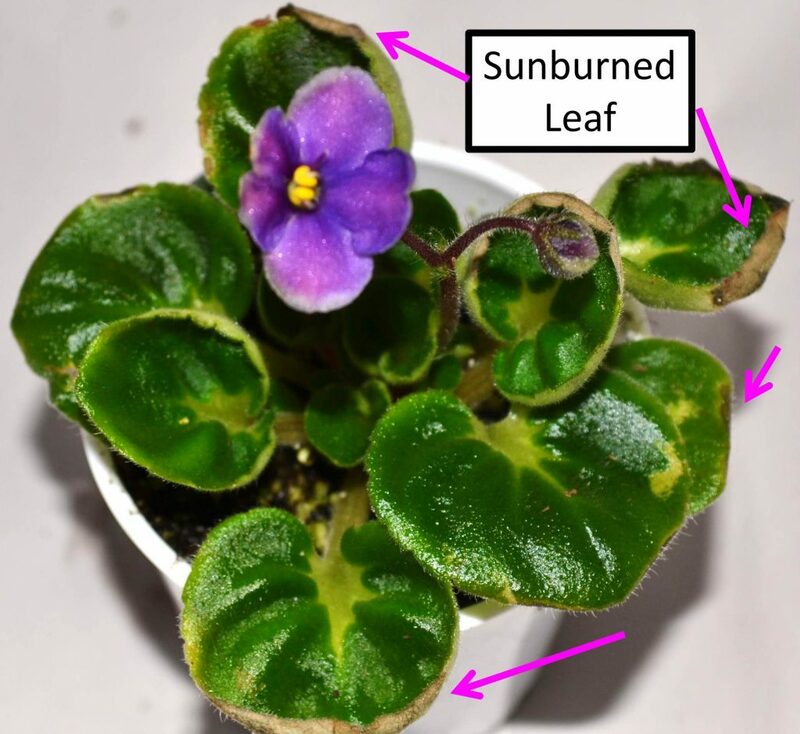 More information about natural light can be found in the “Natural Light for African Violet Plants” article. 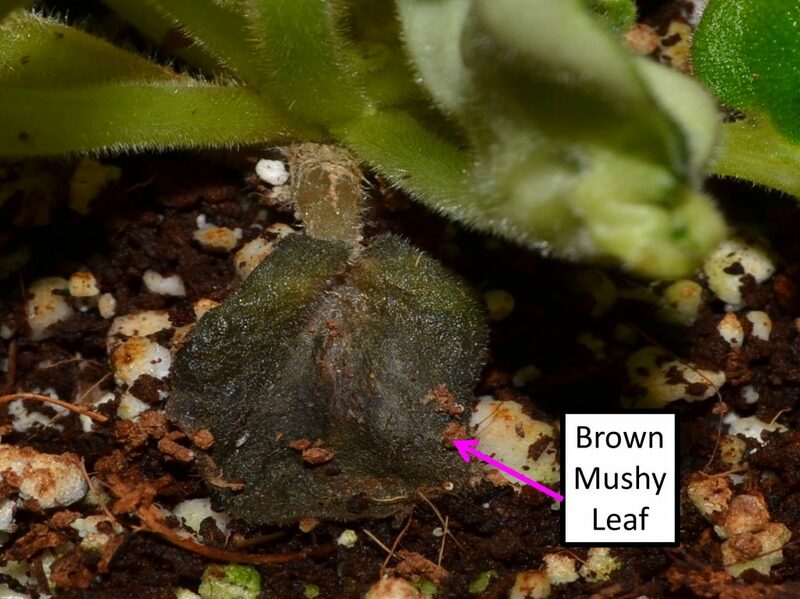 Cold drafts: If the plant is continuously experiencing a cold draft (like near an open window or AC vent), then leaves will turn brown and start to become limp/mushy. 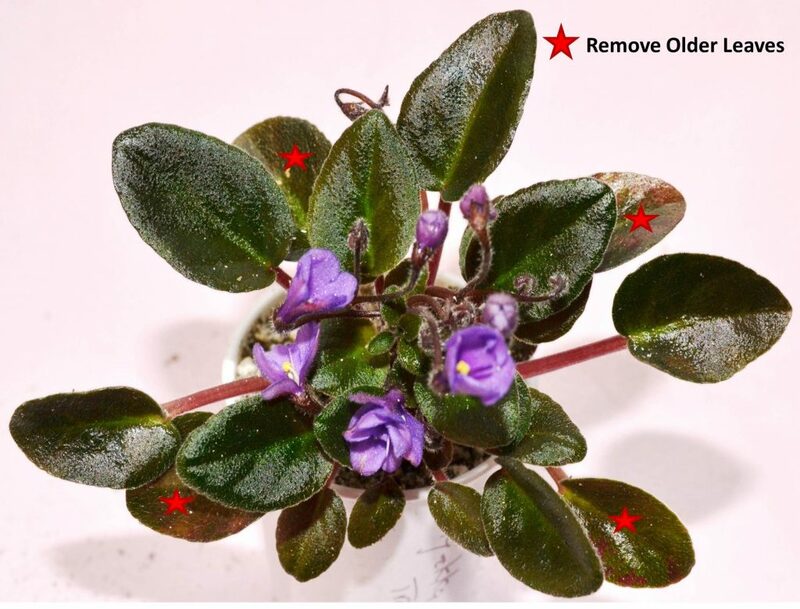 Old Soil Mix: If the leaves on the African Violet plant are continuously browning, even after making above changes, then it’s time to repot. Check the size of the pot; make sure it’s not outgrown its current pot. 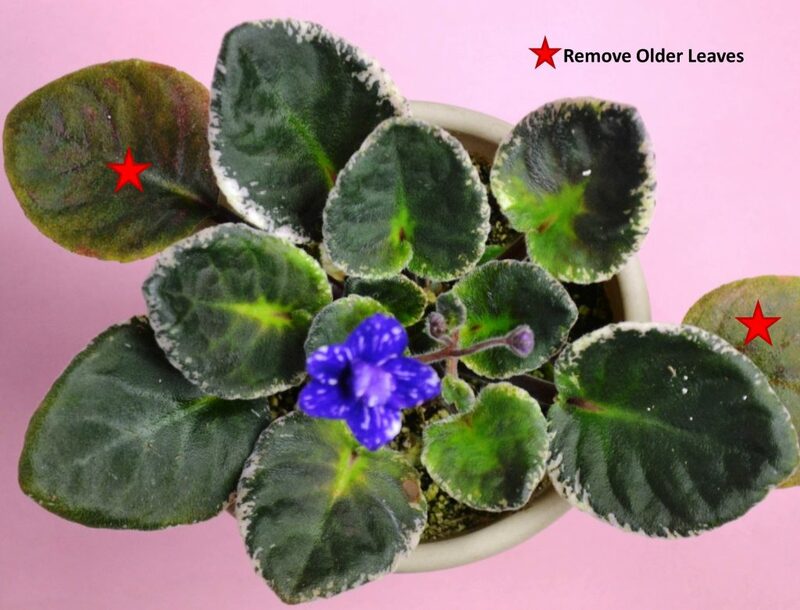 Use fresh potting mix and repot the African Violet. 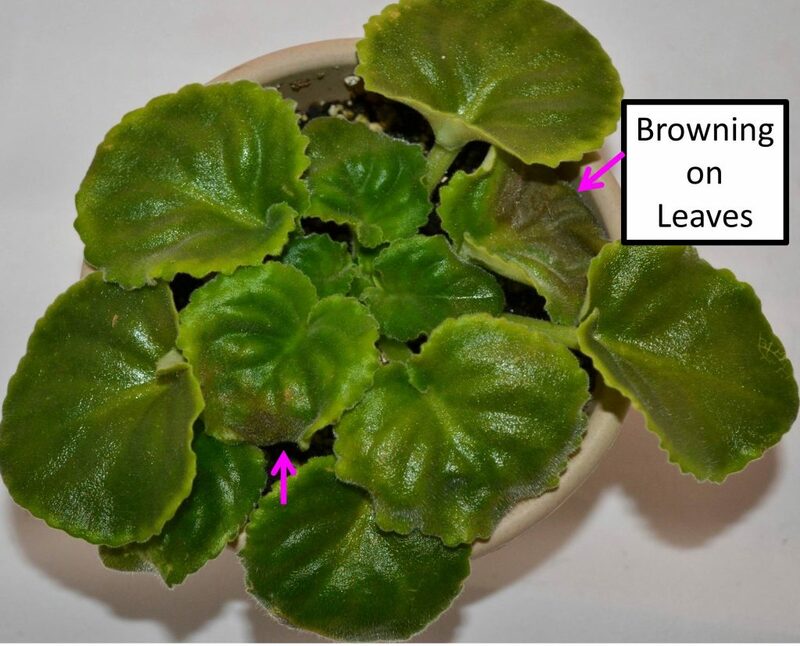 Violets benefit from repotting at least once every 6 months. 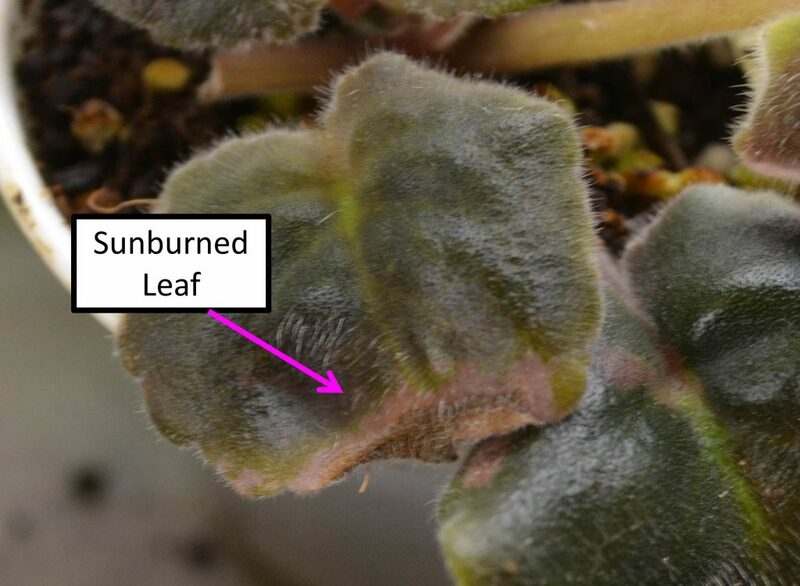 Variegated leaves (white, pink, yellow) in color, are more prone to browning as they are delicate and can get bruised easily. 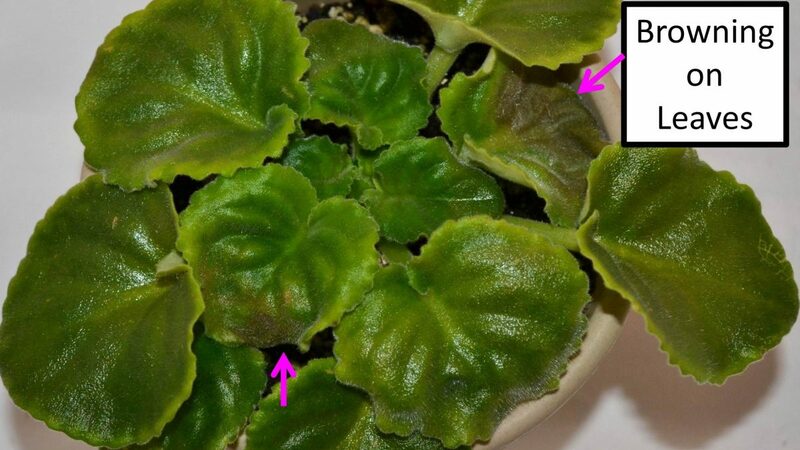 Why do you have to remove brown leaves from African Violet plants? 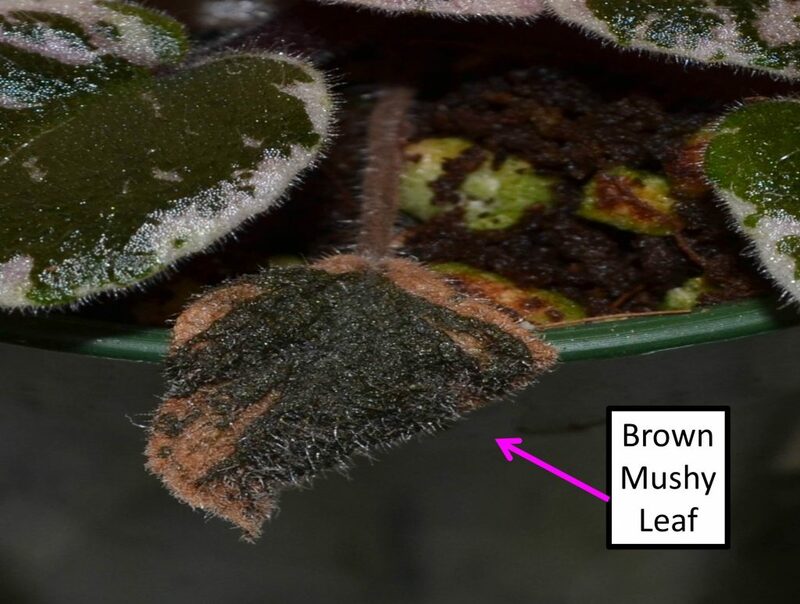 To maintain a healthy plant it is important to remove brown leaves. Once the leaves turn brown, they do not change back to the regular color. 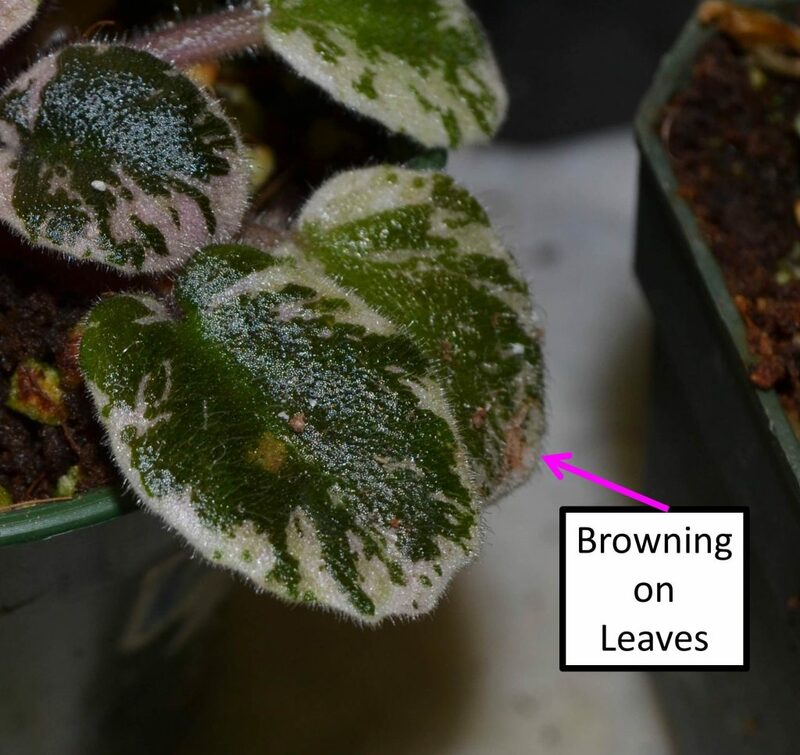 If one leaf is brown, it doesn’t mean the browning effect will spread to the other leaves.